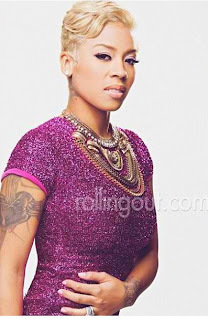 Singer - Keyshia Cole whose album Woman to Woman drops today covers Rolling Out magazine. Keyshia who poses for us in a black leather skirt, a pair of killer black bow-studded Louboutins and new bleached blonde hairstyle discusses a lot of things in her interview with the magazine. The title of your album, Woman to Woman, what’s the meaning behind it? It’s for women who have been through similar situations and can relate to me. It’s for all women. It’s also a personal statement. It has been 10 years since I signed to Interscope. I became a woman before everyone’s eyes. The [photo composite] illustration on the cover was created because some of the songs aren't exactly about me, but they are stories that a lot of women can relate to. During that time, you also fell in love. Do you remember the day you realized Daniel was the one? I thought he was beautiful the first time we met. We had been talking for months before we physically met each other. We had ups and downs in our relationship, and we grew from it. When you make a commitment to marriage, you have to be serious about it. You can love the person you are with, but you have to be sure that you’re ready to make that commitment. This is not only for when times are good — marriage is for the remainder of our lives. [It’s for] building a life and making the best life for your children. Are there any couples in entertainment you admire for being examples of a strong family? I respect Beyoncé and Jay-Z, because I know how hard it can be to stay in love in this business. In the beginning, it appeared as if Jay-Z knew Beyoncé had work to do. I respect that. You can’t go into a relationship trying to change someone. You have to grow with that person and go through everything with them. That’s one thing that I noticed and I respect about them. Of course, I’m not with them every day, but that’s what I see from the outside looking in. When Keyshia Cole spoke on Daniel that was soo sweet! Woman to Woman is in stores today and available to download on iTunes. You can read the rest of the article by clicking on the link below!